“The Official Fansite for the Artwork of Simon ‘Biz’ Bisley”. I’d like to clarify what that means. 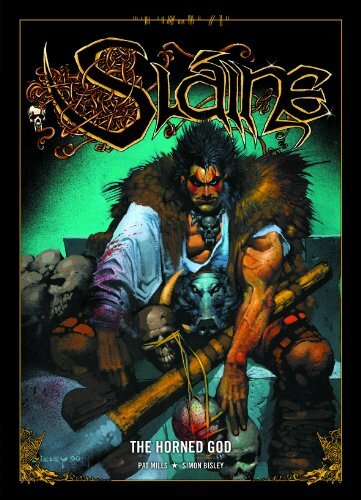 That means that this is the only Bisley fansite endorsed by Simon Bisley. He calls me, I call him, I forward all the emails you send to him, including job offers and various people looking to get in touch with him. He does his best to answer them. There’s the facebook page that we work with, also endorsed by Biz, but this is and always has been a fansite, and is not run by Simon on a day-to-day basis. Having said that, he has a fair influence over the content (he’s called to request changes on a few occasions!) and I’m happy to oblige. We agreed between us that this meant I could call this site ‘Official’. This, then, is as close to Simon’s official site as you’re going to get. I’ve never claimed this was his site, only that we had his blessing. If you can find somewhere on this site that says ‘Simon’s Official Website’, please let me know and I’ll change it. I don’t want to mislead anybody!